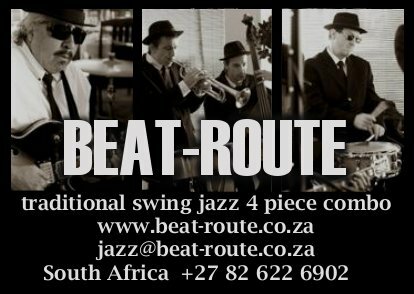 Having been around the block a couple of times Beat-route has built a firm reputation on the local music circuits, we have close on a hundred weddings to our credit from the berg to the north and south coasts, enough corporate functions, Fairs and expos to fill a page and too many restaurant and party gigs to be able to sensibly mention! In ‘08 we featured as part of an installation for a pUblic aRt intervention from the Netherlands – Cascoland, the band played in a park in Warrick triangle during a precession through the various exhibitions which included a beautiful wooden children’s musical jungle gym built by mad designer extrordinaire Xavier Clarisse amongst other projects and dramatic installations. 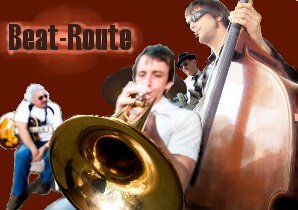 Beat-Route is a classic traditional jazz combo. The band has, over its 3 years, developed an extensive repertoire of originals, standards, grooves, Latin, Afro, popular and show tunes executed with real panache and style in the jazz idiom, and has made quite a reputation in Durban featuring regularly at corporate functions, parties, weddings, fairs, restaurants and on the local jazz circuit. The band also augments adding vocals/sax/keys as and when the need allows. Beat-Route has played countless gigs now and has built good following and relationships on the corporate, wedding and entertainment circuits through a professional attitude and polished routine. 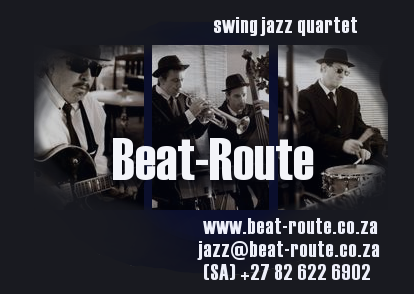 Beat-Route have also played regularly at restaurants BBB, Upper Deck uShaka Marine World, KZNSA, St Tropez, Zulu Jazz Lounge, Manna, Gateway Palm Court, Society and Primi Plantation, and were one of the 2008 main feature established band at the Suncoast month end jazz gig ( and will be again 26 July 09 ). …and too many great Weddings to mention!